This is what happens to 2 1/2 lbs of Jarlsburg and 2 cups of pretty good wine when your drunk brother in law is left in charge of the cheese fondue. He didn't think it was bubbling enough so he adjusted the flame. The smell of scorched cheese registered in my brain almost exactly the same time I heard someone say "Does the cheese fondue taste funny?". But I have to admit that having 30 plus people give Dave a hard time about it for the rest of the night made it worthwhile. Wow, I'd probably cry if that was me. I actually made a chocolate fondue yesterday for the first time. I have to admit that it was pretty damn tasty and for all my lucky friends today, there's enough for another round. I found a cookbook a couple months ago that is from 1970 and is dedicated to all things fondue. I'll get a picture and post it. I am now the proud owner of a 1960s electric fondue pot, so far we have only done the oil fondue for a dinner party. We had marinated pork strips, lamb meatballs, riceballs, assorted veggies and tempura batter, shrimp and mini peirogi and everyone fried away for an hour. I should have gotten some mini milkyways. I wish we'd fondued! We went over to some friends', and the food was, uh, marginal (read sparse and something of an afterthought, like a hodgepodge of their fridge leftovers, rather than a separate meal). Am I being ungrateful, or when one accepts an invitation for New Year's Eve, shouldn't one expect some kind of organized meal (or munchie buffet)? Yep, we did a chocolate fondue that followed the traditional Chinese take-out feast at home. 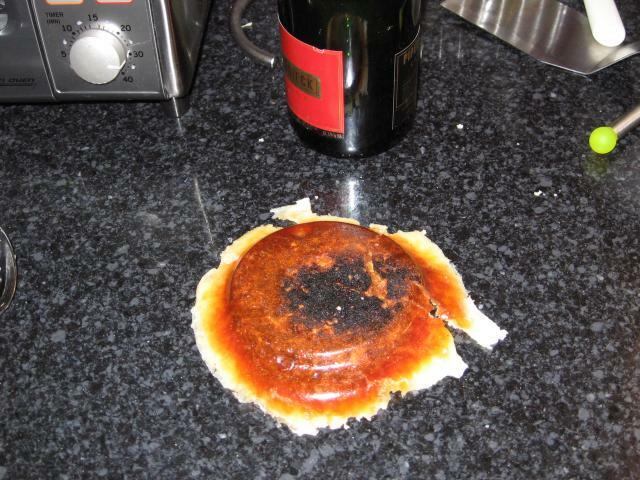 I did a chocolate fondue for NYE 2004. I did a beef fondue for Christmas Day. 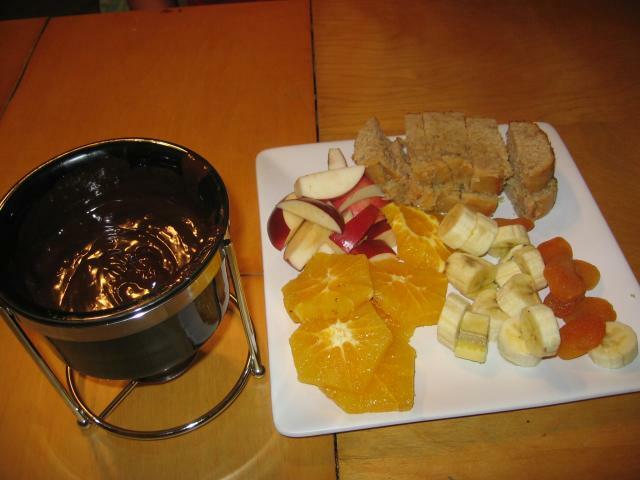 We had chocolate fondue for dessert on New Years Eve. What's a beef fondue, Marlene? Beef fondue is typically done in broth or oil. Using cubes of meat, usually tenderloin or sirloin. Various dipping sauces and sides as well. My preference is to use oil. If you use broth, strips of meat should be used so they can cook fairly quickly. I'll be doing another one in a couple of weeks, and I'll try to remember to take pictures! My parents would set up the fondue for New Years. It was a lot of fun. I think I am going to search for their fondue set and bring back with me in April! i did a cheese fondue for new years. i recently acquired a cookbook called "swiss cooking" from the 70's and decided to do one from the book. however in the grocery store they had a box in the cheese section from switzerland that had all the same ingredients in it- so it made it easier although i don't mind actually "working" in the kitchen. i think it was by anco? something that started with an a. it turned out very good. we dipped apples and french bread. my 4 yr old loved it! -who doesn't love cheese though?? we had recieved a bodum fondue set as a wedding present and thats what we used. the glass insert broke a few yrs ago...so no chocolate until we replace it. I had a fondue party a couple of years ago on New Years for 18 people. We had four fondues going with a selection of beef and chicken for the main course. I used a couple of cans of a fondue broth that I get shipped from New Brunswick by my parents as I can't find it where I live and also made up my own broth made with red wine, beef broth and various spices that I took from a fondue recipe book that I have. We also had a cheese fondue to start off the night with and ended with a chocolate fondue. I love doing fondues and usually have one at least once every year. This year's happened between Christmas and New Year's as a group of our friends were going out of town for New Year's. There were 9 of us and I did the broth fondue again with a bourgignonne (sp?) sauce, ginger sauce and a mustard sauce for dipping the beef, chicken and shrimp. The ginger and mustard sauce were similar to ones you would fine in a teppanyaki restaurant and turned out great. We had a lovely cheese fondue on New Year's eve. I had some cave aged gruyere and emmental, and used a fruity Pinot Gris for thinning. I like to put several whole peeled garlic cloves in at the get-go; they're an added bonus for those willing to troll the depths of the fondue pot. Lacking kirsch, I used Marc d'Alsace de Gewurztraminer instead to spike the brew.....nummers! and a chewy sourdough as the sop. Sour baby pickles, prosciutto and boiled spuds on the side completed the spread. The fondue brought back memories of winters in the Alpes (Swiss and French) and mention was made of a fondue bourgignonne we often made and ate in a Swiss mountain village. Super-thin sliced beef, poached in a bubbling fond, and then dunked in any one of about 6 different sauces. Bearnaise, choron, soubise, curry mayo, mustard sauces are the ones we used most often. It was a Swiss-centric weekend, as a Vacherin Mont d'Or was centrepiece to the cheese plate we nibbled at on Sunday evening! If you use broth, strips of meat should be used so they can cook fairly quickly. "400-pound Peep drops in Pennsylvania to ring in New Year"
The “Chick Drop” is the culmination of Peepfest, a two-day event in Bethlehem, the town where the marshmallow candy is made. I'm dying laughing....Showed the article to my 21 yo son...he LOVES Peeps. 1st question he asks, "Do they make them at Christmas?" They make peeps at Halloween, Christmas and Easter and in various shapes. Google their site for a plethra of images.